In the past generation it has become increasingly common to read about parents going ballistic at their children's sports leagues. In many ways the motivation for this type of behavior is the same as that which occurs getting Zachary and Madison into the best pre-school. But at what price is the pursuit of excellence and win-at-all-costs obtained? The victims are not only the kids, who are robbed of their childhood and their sense of play, but the parents themselves, who, in their zeal for self-aggrandizement, lose their own sense of innocence. So ingrained are the notions of survival-of-the-fittest and "nice guys finish last" (former Brooklyn Dodger Leo "the Lip" Dorocher's take on Social Darwinism) that the vision of what true evolution looks like at this time in human development remains buried under reptilian instincts and territorial imperatives. Now who was it that said, "Except as you be as children, you shall not enter the kingdom of heaven?" While this may seem like some new age or bleeding-heart lamentation over the cruel facts of the real world, it is, instead, a spiritual argument for reclaiming our child-like wonderment at the gift of life. Still, in a culture that defines itself by violence, media manipulation, purchasing power, and looking out for number one (while paying lip-service to pseudo-religious observances), it is no easy task to get folks to enjoy a game for its own sake. These are the core issues, and not the interactions between two dissimilar little league coaches, that is at the heart of the Arvada Center's current production of Rounding Third. 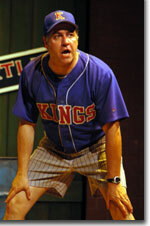 Mis-marketed as "a guy thing," the play is rather a serious discussion of the real lessons to be learned in team sports, as well as the particularly male challenge of reconciling aggressiveness and nurturing. Director Alan Osburn's casting supports the conflict and underscores the contrast between the two characters around which the entire drama is built. Tom Borrillo is Don, an ex-jock whose all-consuming passion for sports has been refocused on coaching Little League baseball. Like so many former athletes, Don's self-concept is heavily dependent on his "Glory Days," believing that his once exemplary prowess on the field automatically qualifies him as an expert coach. 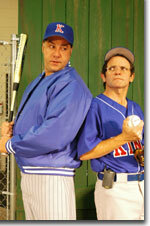 Borrillo's Don is both breezy and a blowhard, rattling off baseball truisms and personal prejudices in the same breath. We know this guy; we've played ball with him; he takes up a lot of space—more than his allotment. Kelly Walters is Michael, a Wally Cox to Borrillo's Jackie Gleason. He's meek, even effete, at times, showing up with lattés instead of beers. But while he takes guff from his boss and from Don, he sticks to his guns when it comes to making the game fun for all the kids, and not just about winning. In his own nerdy way, Michael can be as irritating as Don, calling out ignorant advice to the diminutive ball players, but Walters never flinches, making Michael's altruistic talk stand up to scrutiny. When the emotional tables turn in the second act, Walter's steady as she goes portrayal enables his relationship to Don remain believable. Playwright Richard Dresser attempt to walk across a perilous tightrope with this piece, touching on a variety of far-reaching social issues in the context of a game already rich in literary treatments. Yet the stark setting of two men at the edge of a symbolic playing field with highly defined rules and etiquette somehow provides the existential basis where such discussions seem appropriate—proving Michael's point that the lessons to be learned here transcend the game of baseball. 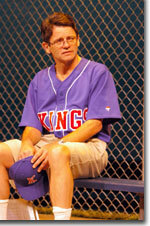 The Arvada Center's production of Rounding Third runs through October 10th.